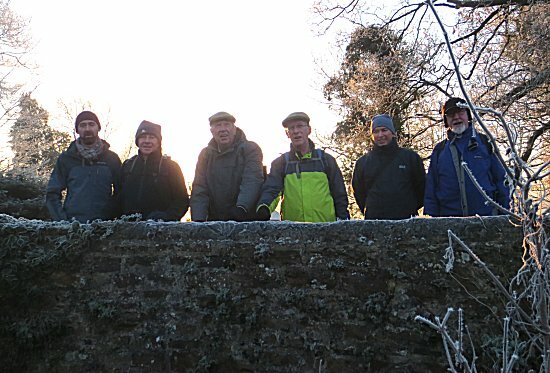 Just five walkers gathered at Lord Thoralby's residence at 8:30am, where they were treated to a splendid cooked breakfast. 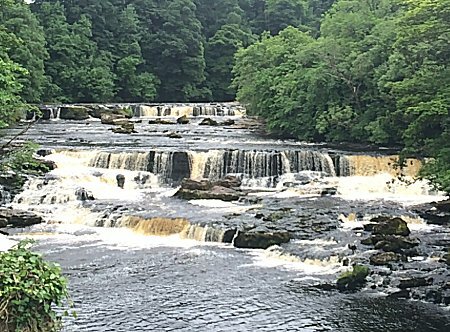 After a rapid transfer to Paul's house, the walkers set off northwards towards Aysgarth Falls, where they gazed upon the splendour of the fast flowing water. 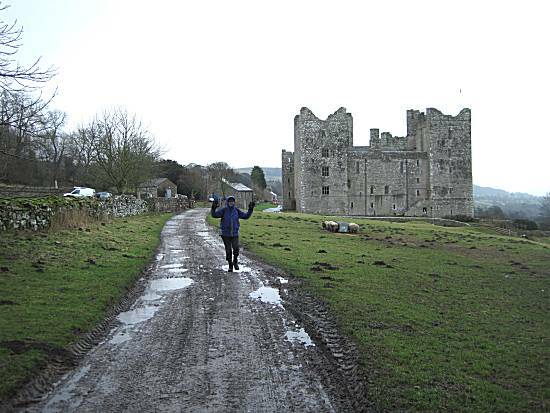 Tom felt elated, on reaching Bolton Castle, where they consumed some of Alan's special 'Elite Meats' individual pork pies in the entrance to the adjacent St Oswald’s Church. 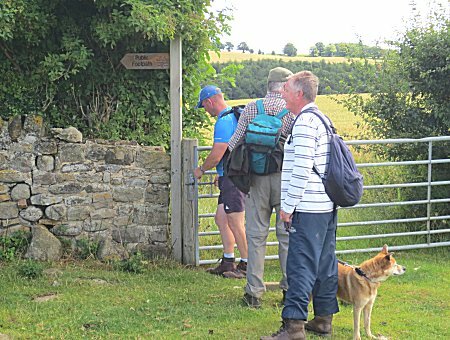 The walkers quickly learned that the church dated back to the 14th century although carved stones built into the tower may indicate an earlier 12th century structure. 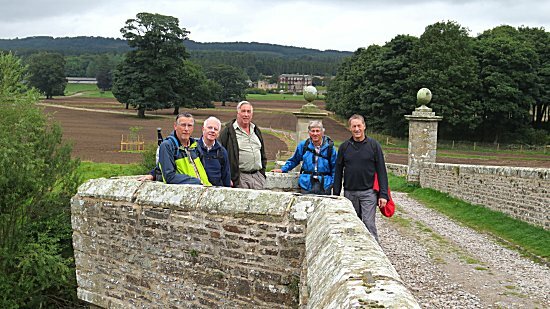 They noted that the sundial on the porch is now permanently shadowed by Bolton Castle showing that the latter was built at a later date. 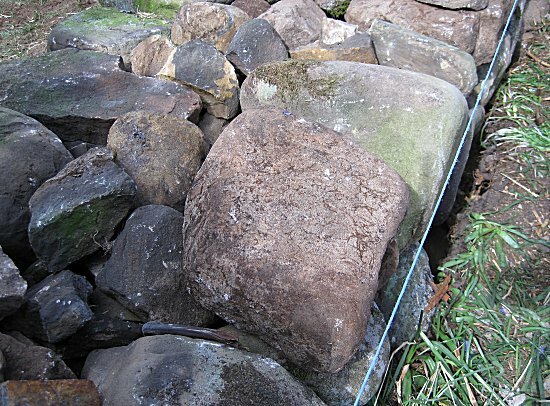 They also learned that the sedilia (triple stone seats) were a particularly fine example and is of the Decorated Period when the church was originally built. 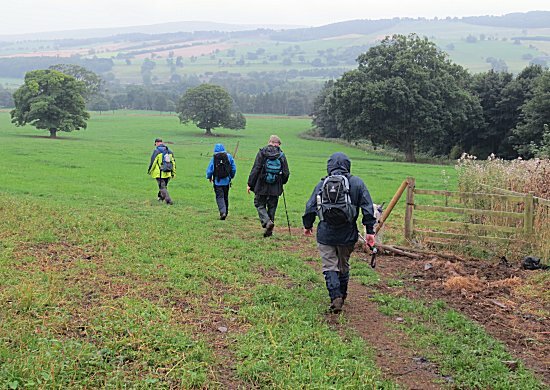 The walkers set off on the long and desolate journey across the moorland towards Carperby, as the rain set in even harder. 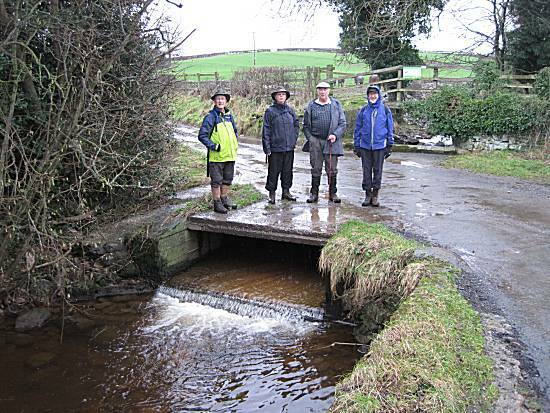 Conditions became worse for the walkers as they battled their way across the moors, desparate to reach the safety of 'The Wheatsheaf' in Carperby. 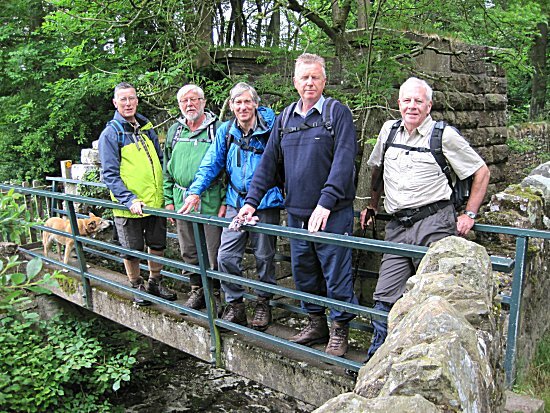 Using their incredible navigational skills the walkers accurately located The Wheatsheaf in Carperby and ordered quantities of Jennings Cumberland Ale (except Ron), together with individual portions of nourishing chips. 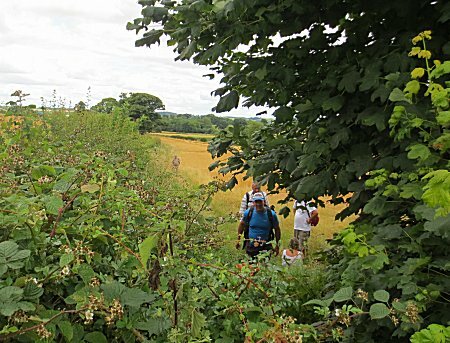 The walkers were particularly grateful to the young serving girl, who brought out a 'spare' portion of chips, much to the appreciation of the hungry walkers. 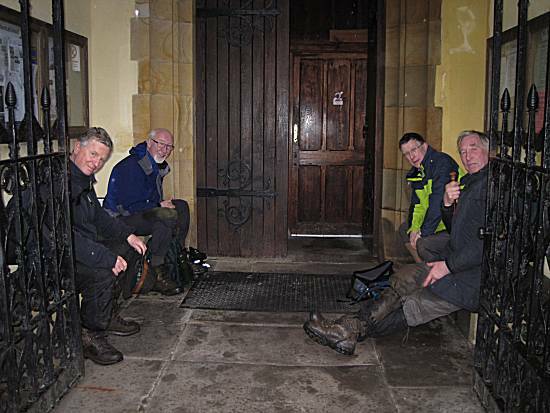 Conditions were no better on leaving The Wheatsheaf, but the cunning walkers found a place to rest and share their remaining pork pie supplies in the entrance lobby of the Grade II listed St. Andrew's Church in Aysgarth, which they learned was substantially rebuilt in 1536 and restored in 1866. 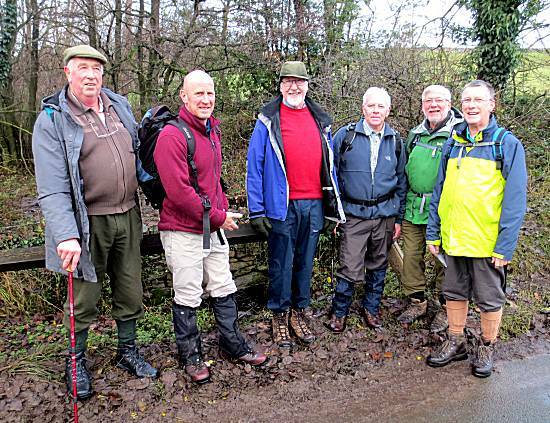 The walkers arrived back at Paul's house shortly afterwards and departed to their loved ones after another successful, but wet walk. Chip Score: individual portions of good quality chips, with a bonus portion!! 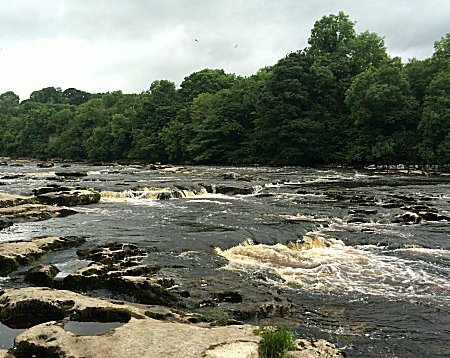 Weather: Light rain all day, getting harder in the afternoon. 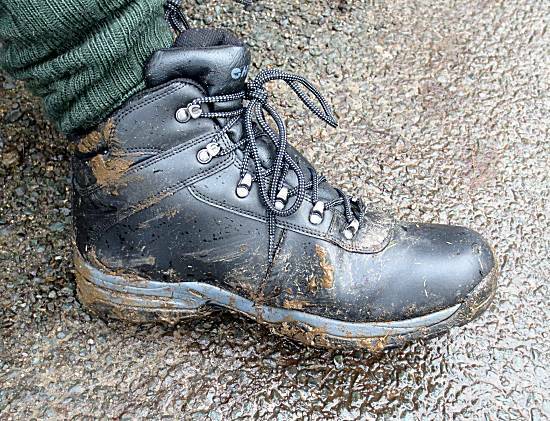 A very muddy day. 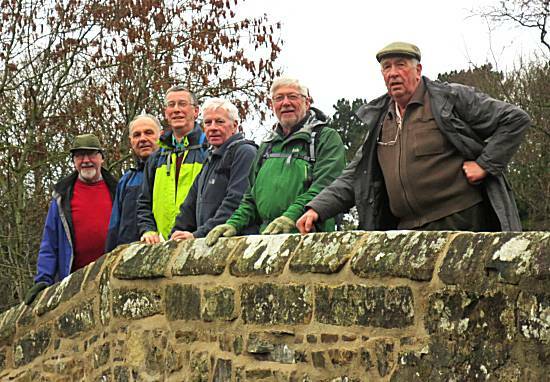 Six walkers arrived at the appointed meeting point near the Bridge House Hotel in Catterick Bridge and set off following a route planned by Tom and Ron, to search out the historical facts of the area to the benefit of the population of England. 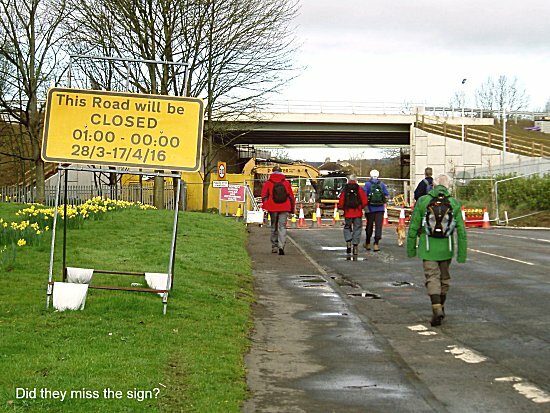 Within 500m of the start, the walkers were prevented from following their plan due to roadwork's on the A1(M). 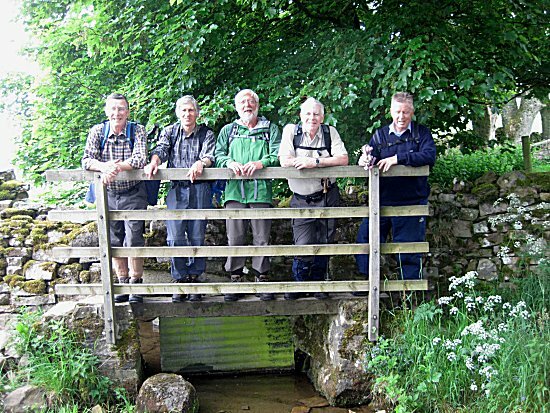 The walkers denied incompetence even though they were still seen in Brompton-on-Swale after an hour's walking!! 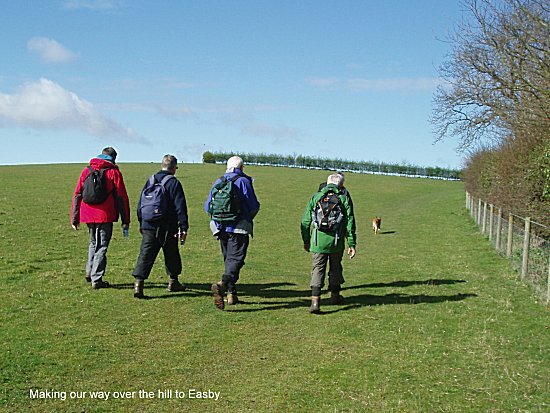 Crossing the road at Broken Bray caravan site they followed the path to Easby where they quickly discovered the Abbey ruins. 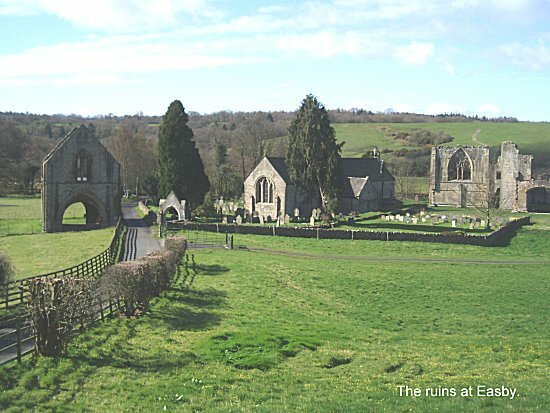 They instinctively knew that this is one of the best preserved monasteries of the Premonstratensian 'white canons', with the magnificent refectory, gatehouse and canons' dormitory remaining. 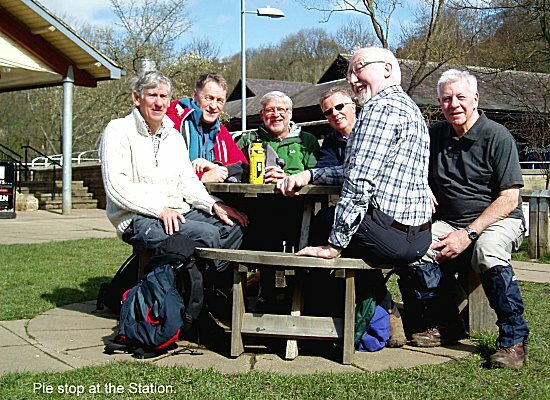 They continued on to the old Richmond Station where they took advantage of the picnic tables for their pie stop. 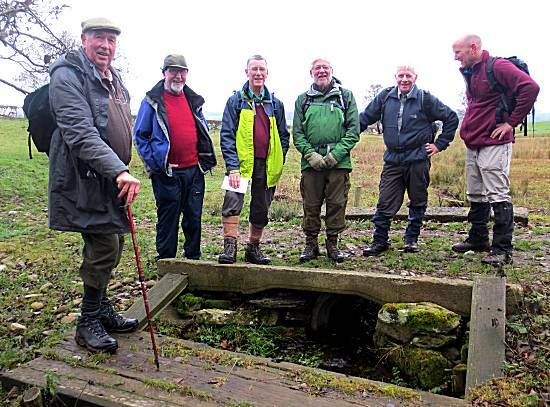 Despite attempts to block the old railway line, the walkers found indisputable evidence that Brunel had built the Richmond branch line, by finding a drain cover on which he had carved his name!! They knew that the history books will need to be re-written. 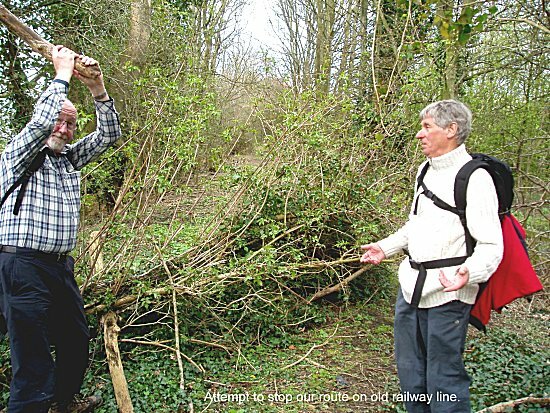 After their groundbreaking discoveries, they following the old rail line for 500m before turning right onto the 'Coast to Coast' route to Colburn Village and the Hildyard Arms. 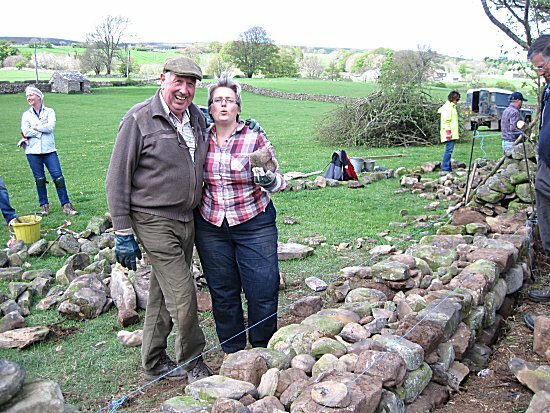 Oh dear . . . . the Timothy Taylor's was not on . 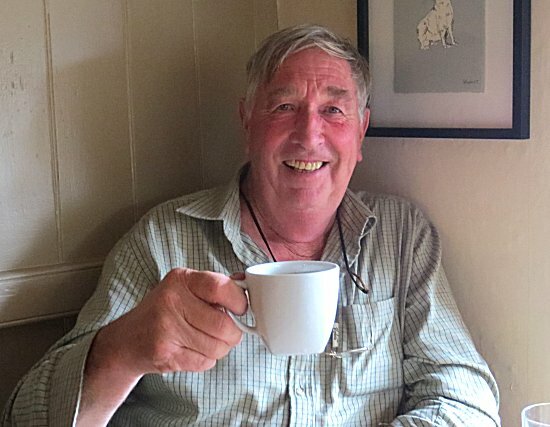 . . . . but, the Landlord, on learning of the walkers desire for this ale, immediately connected his last barrel for the thirsty walkers to consume. 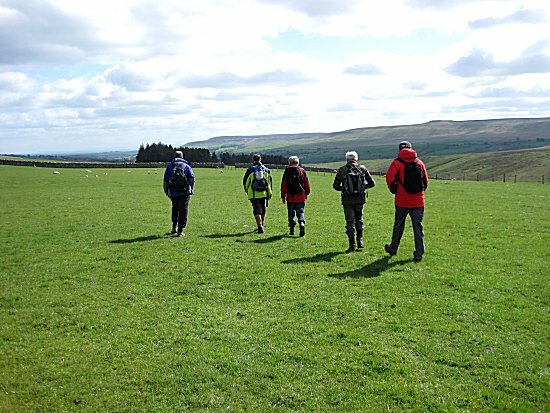 The walkers agreed that the beer was FANTASTIC and that individual bowls of the luscious chunky home made chips were AMAZING. 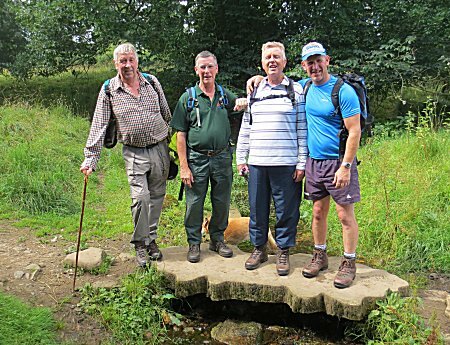 Tom and Ed tried to empty the barrel, but the others dragged them away to complete the 'Coast to Coast' route back to Catterick Bridge. 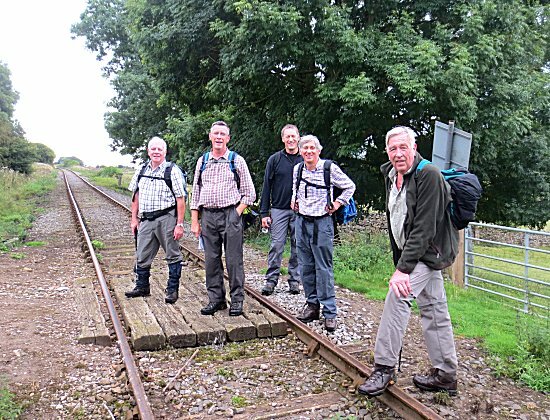 The walkers considered that greater forces were trying to deter their mission by attempting to close footpaths, but they remained unconcerned and merely changed their route to pick up the old railway line from Catterick Camp to Darlington. 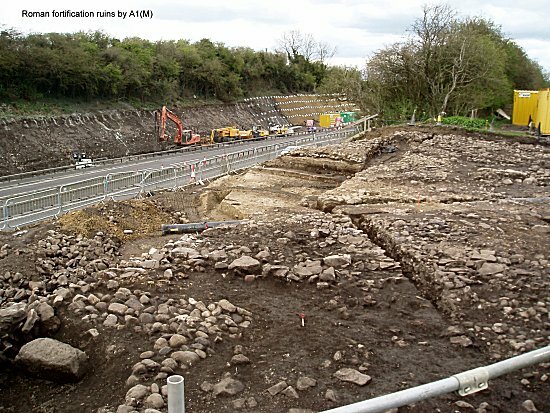 At the walk's end, they discovered another archaeological site where the A6136 crosses the A1(M) and agreed that it must be the ruins of a Roman fortification (perhaps why the area is always referred to as "Fort Bridge"). Their vehicles were parked barely 300m away. 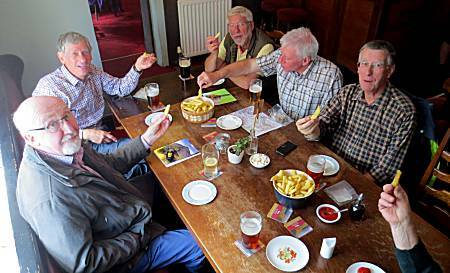 Chip Score: individual bowls of the luscious chunky home made chips!! Weather: Glorious sunshine throughout the day. 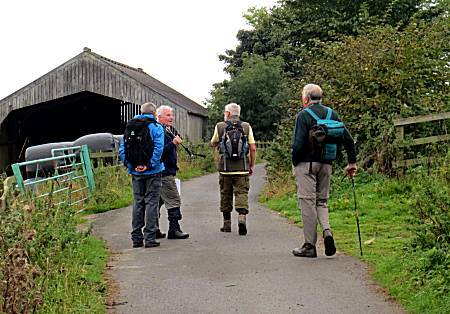 Six walkers arrived in the hamlet of Gammersgill eager to consume bacon, sausage and egg butties. 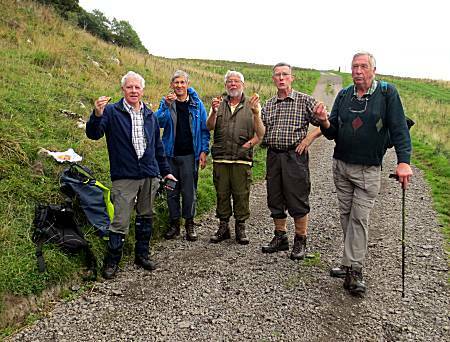 However, as both the master butty cooks were not available, the walkers had to set off without the benefit of such nourishment. 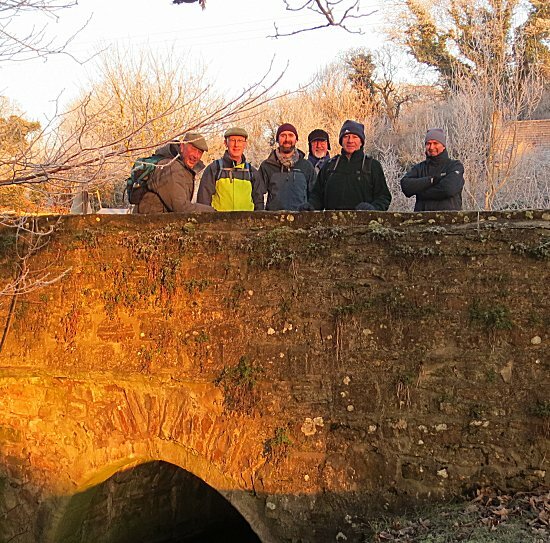 Without butties, the walkers knew that finding bridges was their only hope of survival under the testing conditions and, as anticipated, were remarkably successful in that task. 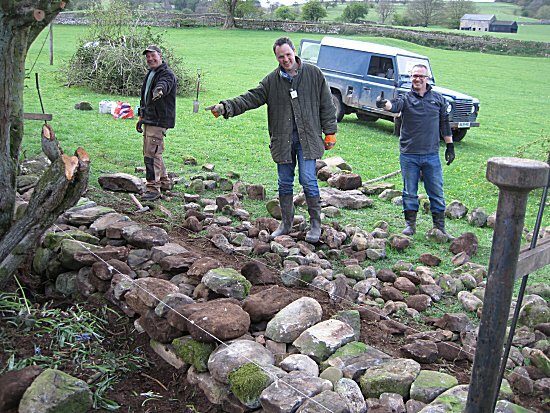 With renewed strength, as they made their way across the difficult moorland, they became aware that Cliff was in fact attempting to rebuild numerous dry stone wall without experienced helpers. 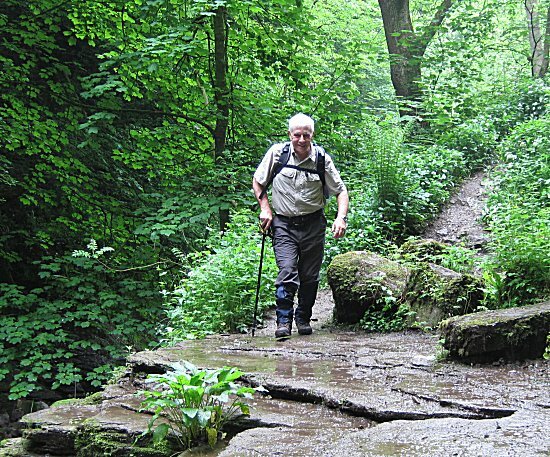 They instinctively knew that they must find Cliff and provide guidance. 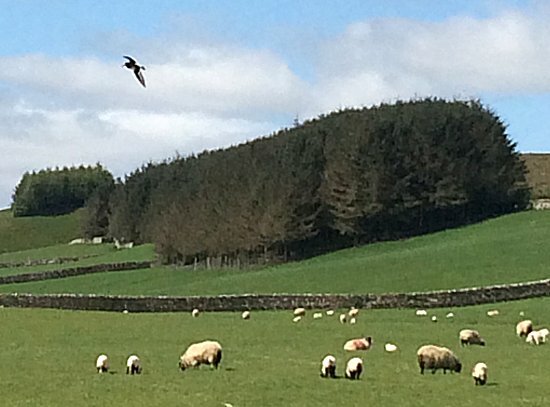 Desparately lost, the walkers were grateful to a local Oystercatcher who showed them the correct route. 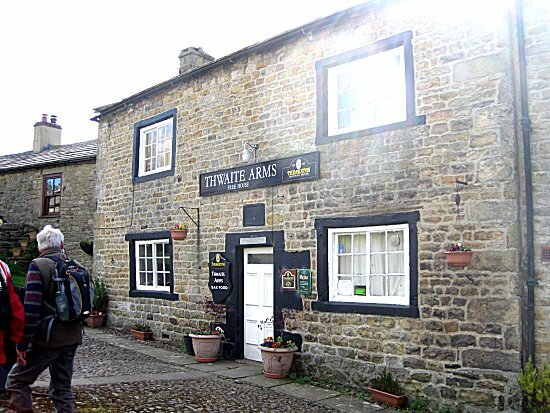 As the walkers passed through Horsehouse, they remembered with horror visiting the Thwaite Arms some years before. 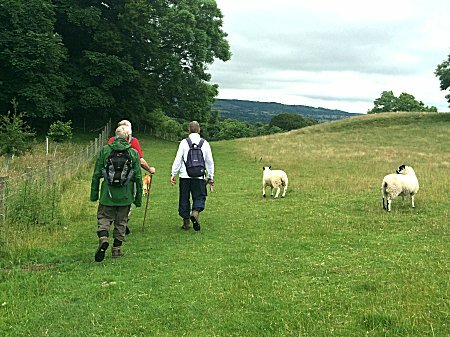 They hurried onwards!! 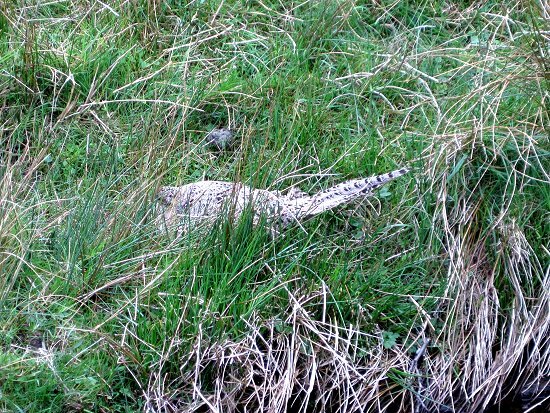 The walkers consulted a local pheasant, who was busy hatching her eggs. 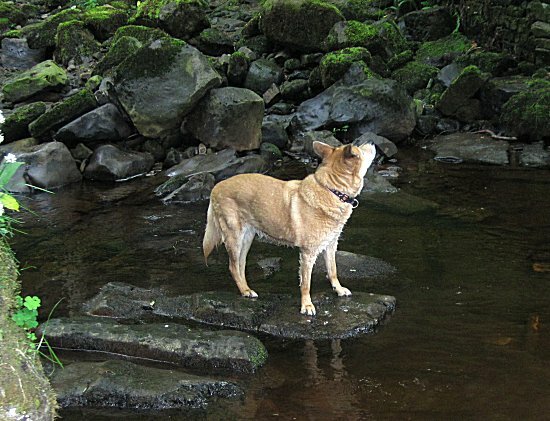 She provided them accurate information regarding Cliff's location. 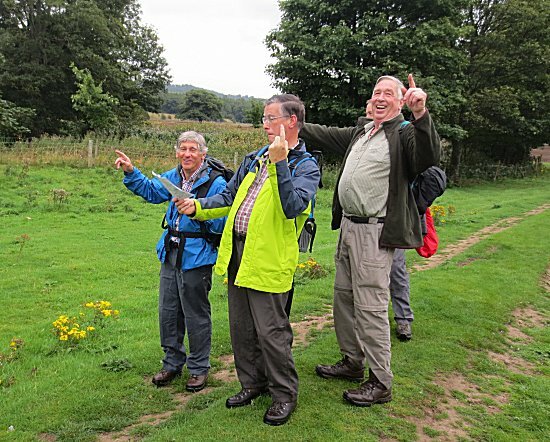 As the walkers set off they knew that they were getting close to Cliff's wall building site. Their pace gathered as they got closer!! 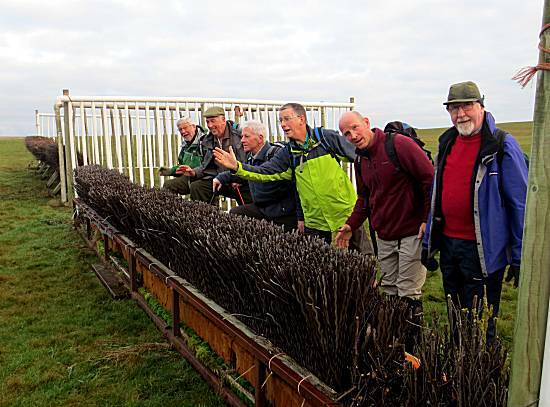 Much rejoicing was seen when the walkers located Cliff's wall building field. 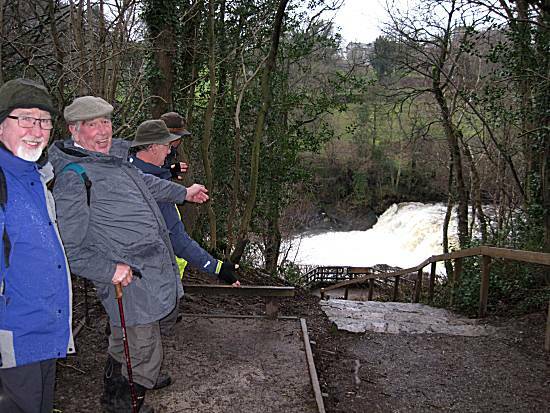 However, the walkers were appalled at the slow progress that had been achieved!!! 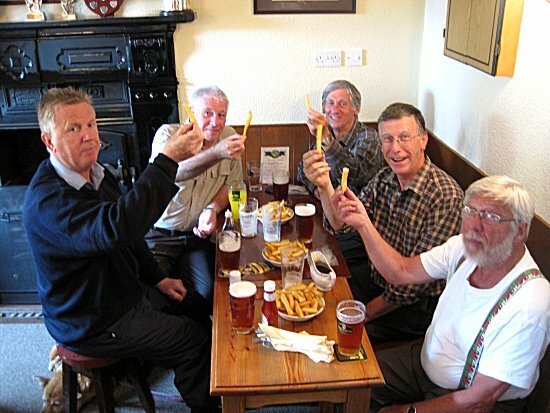 Chip Score: individual bowls of the chips, but slightly 'soggy'!! 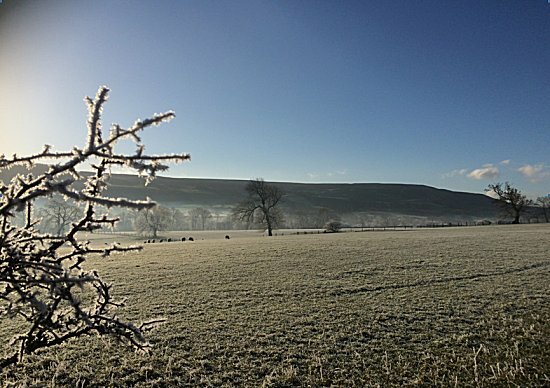 Weather: A cold start, but turning into a fine walking day. 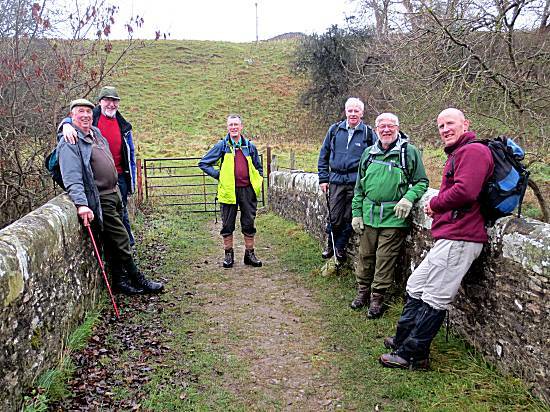 Six walkers arrived at the old premises of Weatheralds between Askrigg and Bainbridge, which the astute members realised was the old railway station building with much of the platform still in place. 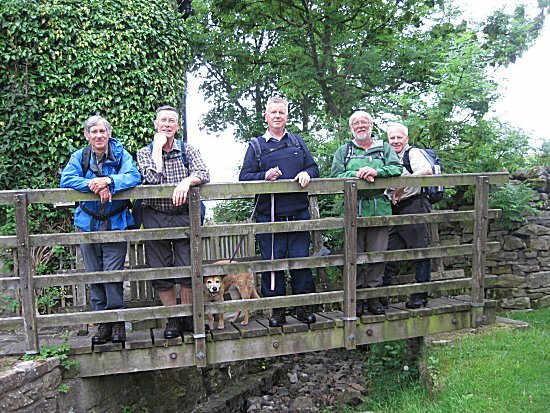 After delicious bacon, sausage and egg butties, courtesy of Ron, the walkers set off. Cliff had sent his apologises for his absence, with a lame excuse of needing to visit his caravan!! 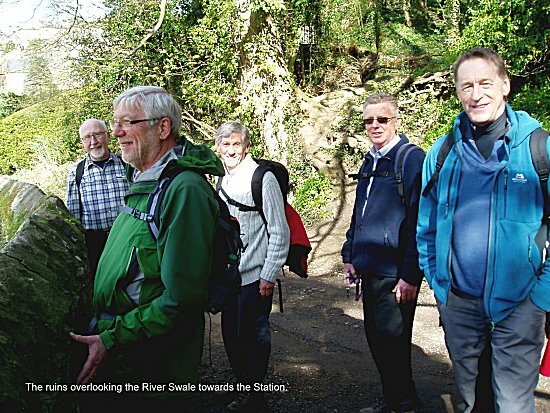 Sean had also threatened to 'definitely' attend this walk but also claimed that work was again getting in his way. 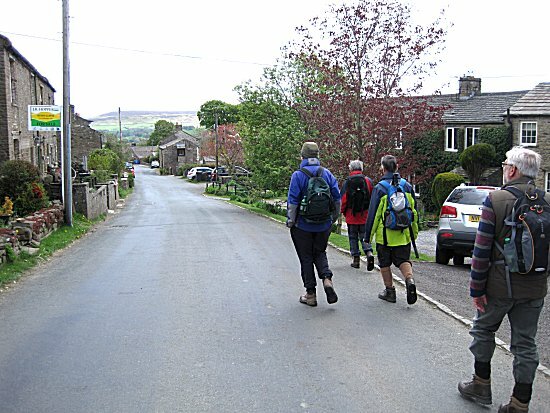 The walkers had heard rumours that there was a severe shortage of electricity in Askrigg that was gravely affecting the operation of the local brewery and the beer pumps at The Crown Inn public house. 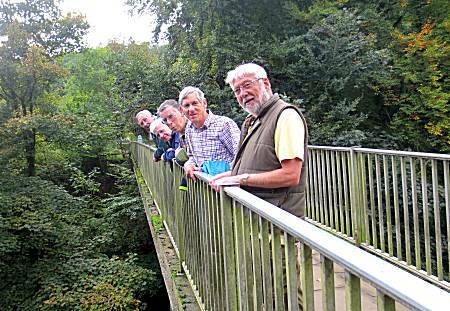 They quickly visited a number of bridges and attempted to formulate a cunning plan. But, even more bridges could not help their dilemma!! 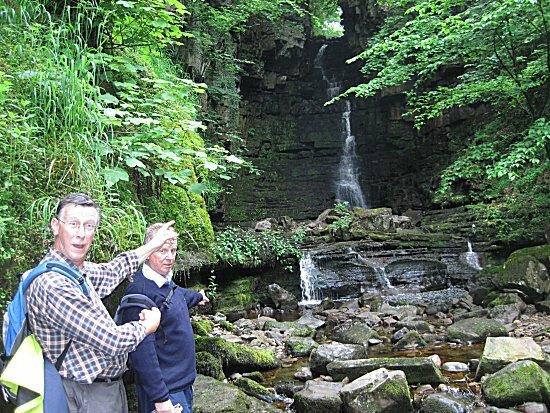 The walkers decided to head for Whitfield Gill Force in their attempt to find a solution to the major problem. 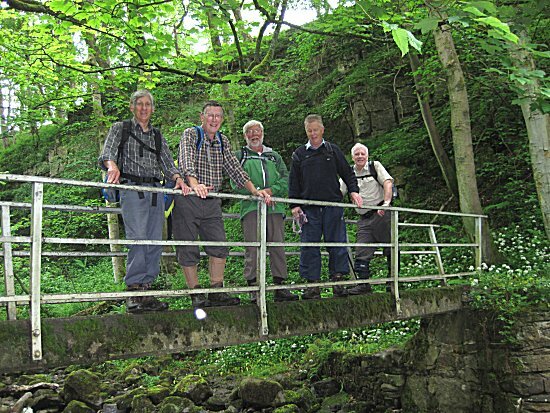 As the walkers continued down the Gill, seeing the remains of several Mills, their plans started to formulate!! Soon the undergrowth slowed their progress. 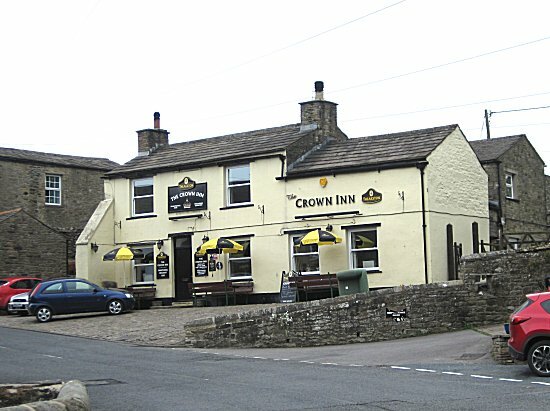 Would they ever be able to find their way to 'The Crown Inn' at Askrigg? 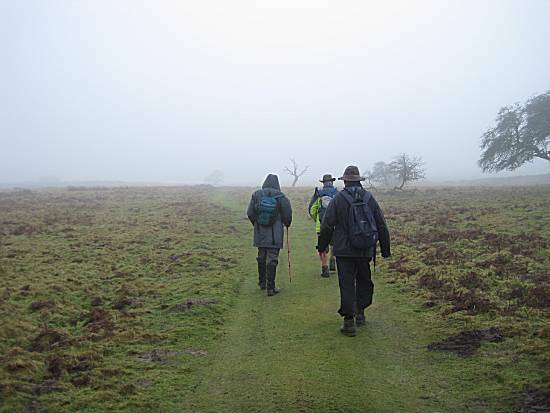 Ed decided to lead the way through the dangerous conditions. 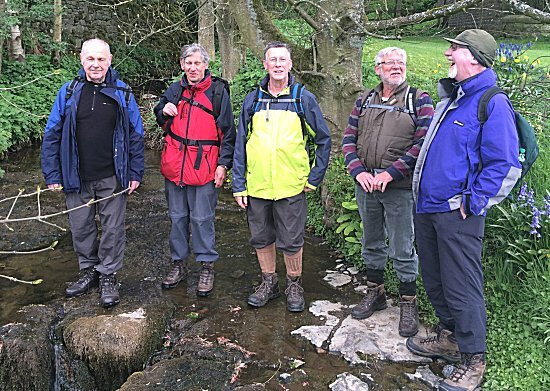 A welcome Pork Pie stop helped the walkers achieve their goals and then they quickly located a giant waterfall, which gave them some ideas!! 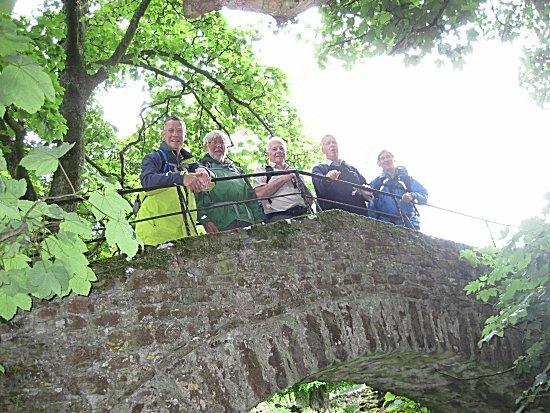 As the walkers crossed the last bridge, it was obvious that Ella knew the way and quick led the walkers to safely. 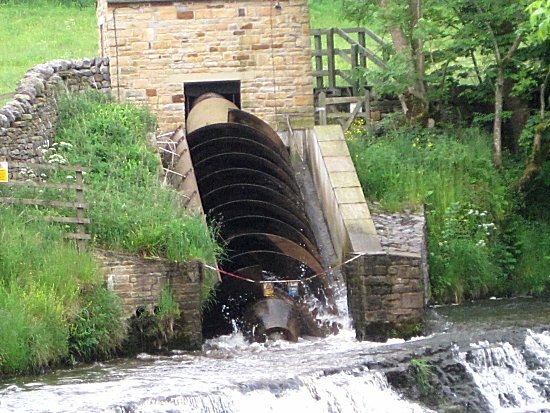 Putting their combined skills together the walkers quickly constructed a 45kW Archimedes Screw generator system in Askrigg to power the brewery and beer pumps at 'The Crown Inn'. The locals were eternally grateful. 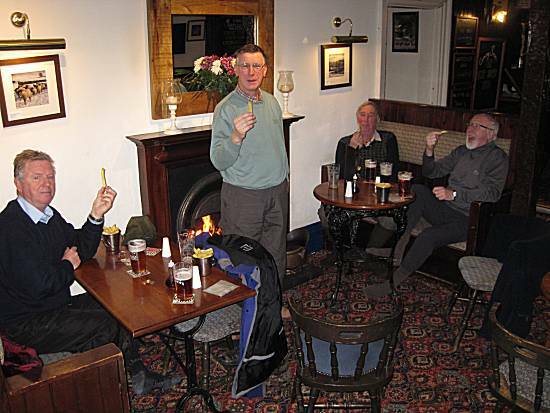 Almost immediately the brewery burst into life and beer started to flow at 'The Crown Inn'. 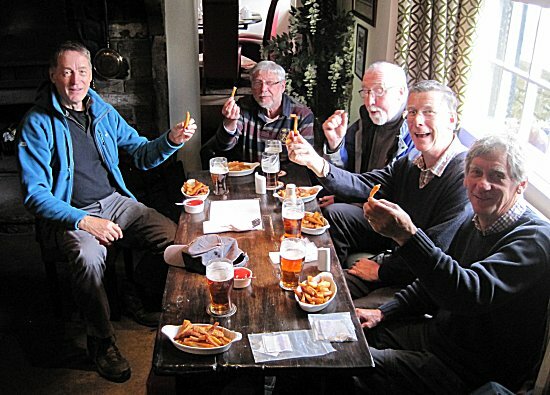 The walkers celebrated their success, with nourishing chips with their Black Sheep ale in 'The Crown Inn' in Askrigg. 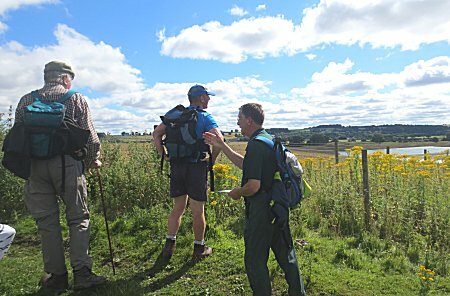 After the lunch stop, Paul lead the walkers along some more difficult paths, which soon opened into large buttercup meadows. 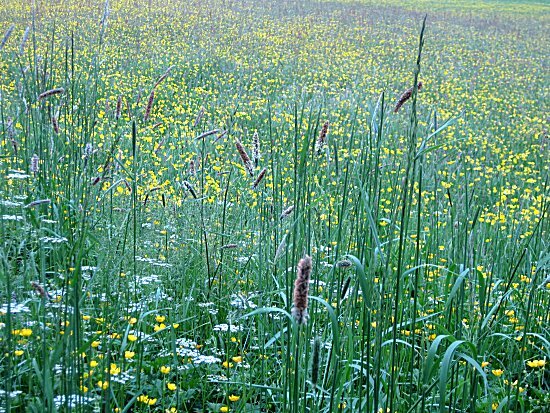 Endless fields of buttercups lead the walkers back to their cars. 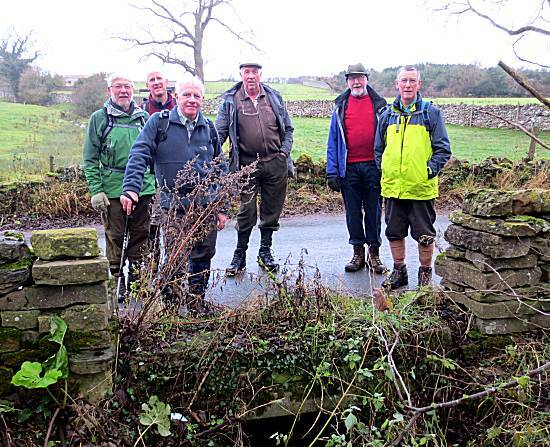 They knew that their efforts today had greatly affected the lives of those living in Askrigg. They knew though that this was just part of their mission in life!! 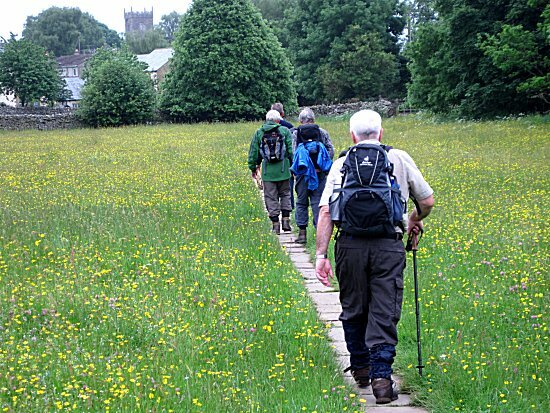 Weather: Warm and Dry, but overcast - A fine walking day. 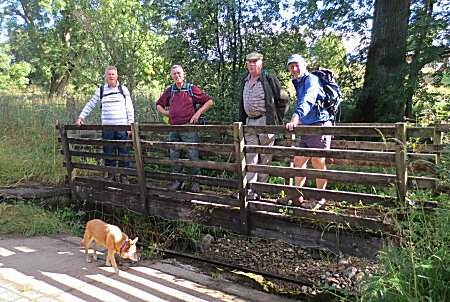 Walkers: Paul (leader), Colin, Alan, Ed, Ron, Andy & Ella the dog. 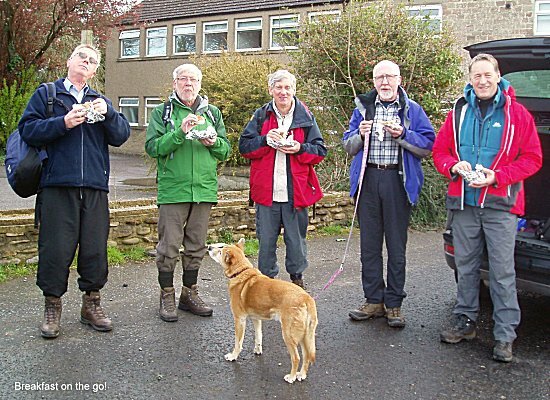 A much depleted group of Andy, John and Ron, with Ella the dog, met at Cliff’s house to enjoy smashing egg, bacon and sausage butties before facing the rigors of the day. 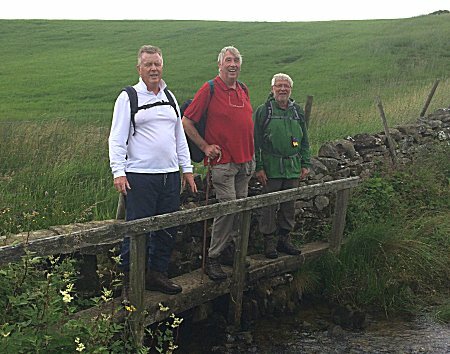 They set off for their first test, a flog over Aysgarth Moor to Seta bridge, where Ron suffered from a lassitude commonly known as old and incompetent Biker’s Legs on the grueling climb northwards. 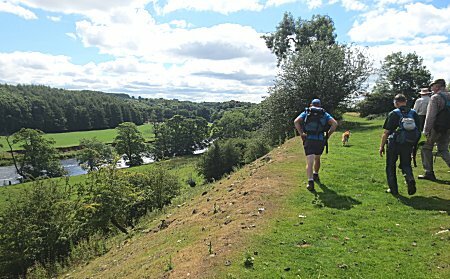 Cliff kept an experienced eye on the storm clouds to the west and thankfully concluded that the group should refrain from walking in that direction, in order that they could reach Seta Bridge in good order ready to cross the mighty River Ure. 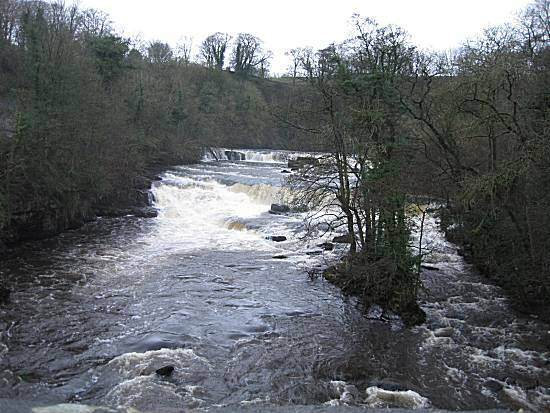 Seta bridge was reached just in time for Andy to spot a salmon leaping!! 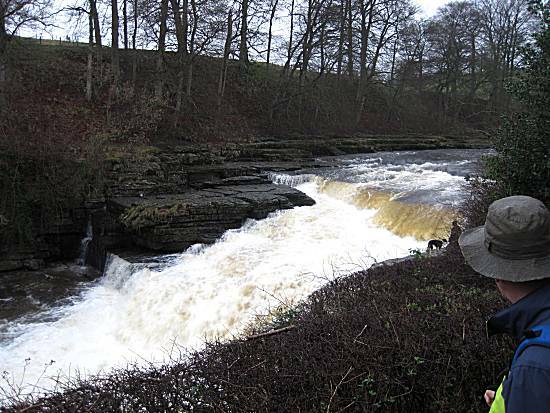 Here the walkers headed east towards Aysgarth and, to the delight of the party, were forced to take Coffee at the Café in the Watermill annex, adjacent to the giant Asgarth Falls. 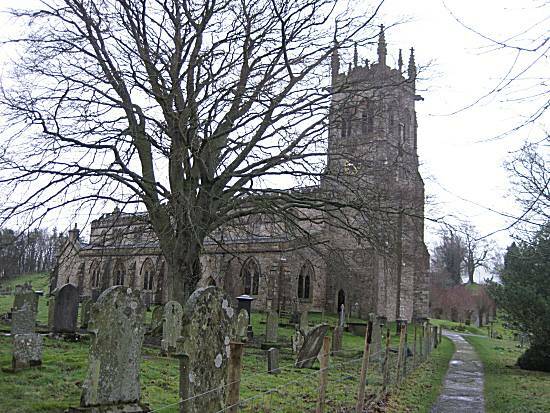 On leaving, they wended onward and upward through the Church Yard to turn east following the River on it’s southerly bank. 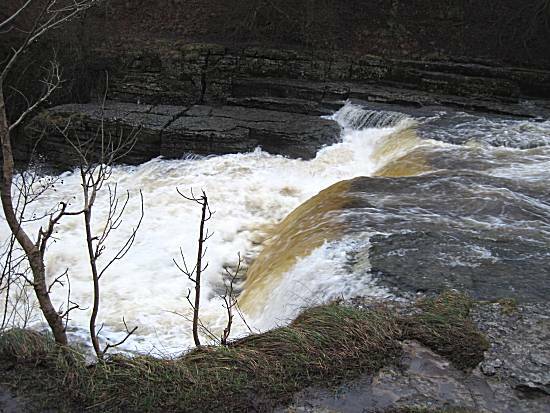 A Pork Pie stop was enjoyed on the rocks close to a mighty torrent. 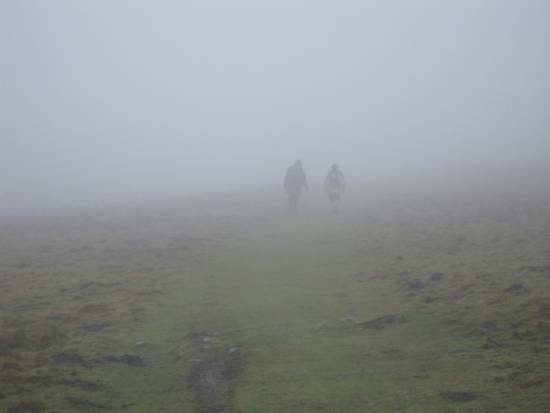 Soon the walkers became desperately lost!! 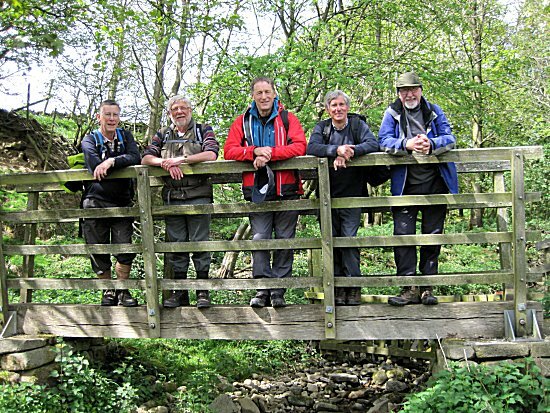 They knew that they needed to reach Edgely before turning south west for the long hike to West Burton for their planned lunchtime stop at the Fox and Hounds Inn, but became confused by the difficult terrain. 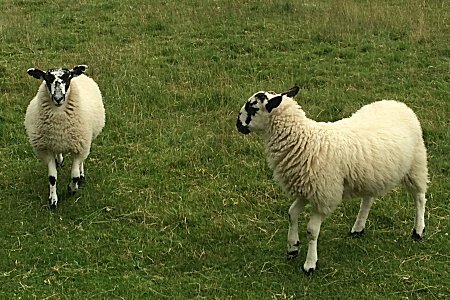 Quickly they were approached by 2 locals in disguise, who guided them accurately towards their lunchtime destination. 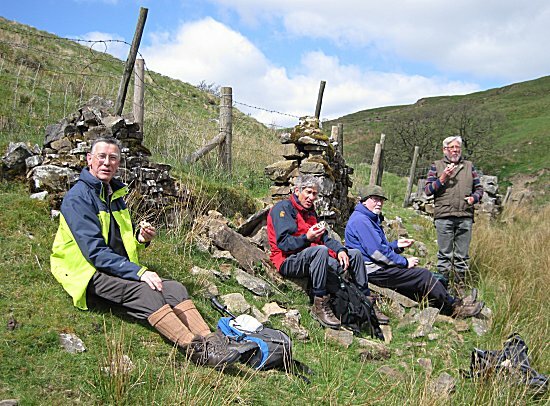 On arrival at their lunchtime stop, the walkers failed to notice that Paul had parked his bright white, sign written van opposite the pub (apparently he had also texted Cliff several times during the morning), so they were amazed to find him nursing a beverage upon their arrival. 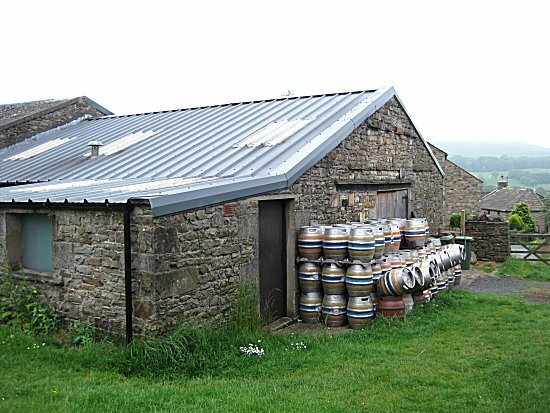 Regretfully the ale was on mixed form, so it was a little while before testing could be completed and Black Sheep settled upon. The esteemed Scientist in their group, Tom, then arrived having luckily missed the experimentation phase, however, his deep knowledge and scientific rigor would have been indispensable in their efforts. Happily the chip portions turned out to be both generous and delicious. 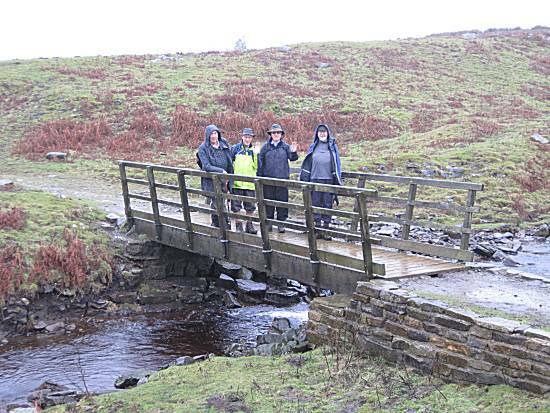 As the walkers were not there to enjoy themselves and despite kind offers of lifts, the group decanted into the lashing rain for the last leg of the grueling test, stopping at every bridge to maintain their strength. 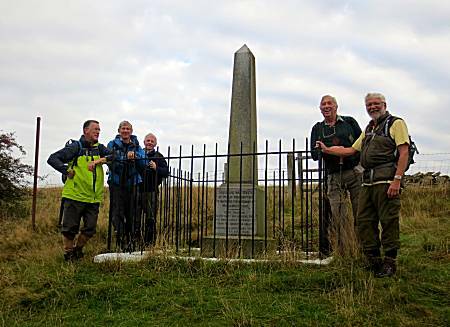 Manfully they plodded westward to Newbiggin, and onwards, eventually arriving into Thoralby. 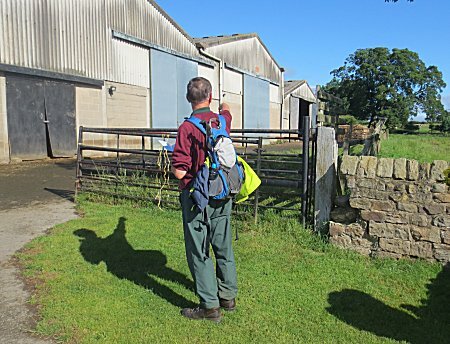 Mysteriously as they walked through Thoralby, first Andy, then John just vanished!! What could have befallen them? 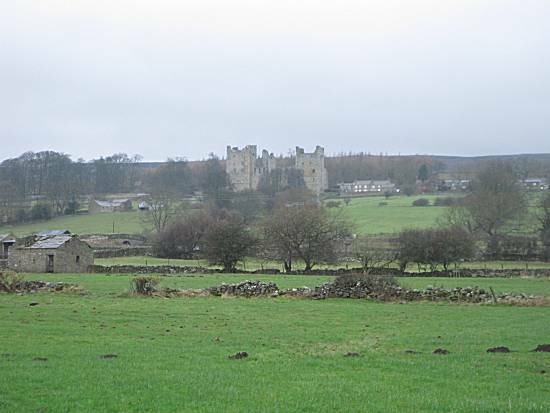 Ron considered that they must have been lured into dens of iniquity that, rumor has it, abound in Wensleydale. 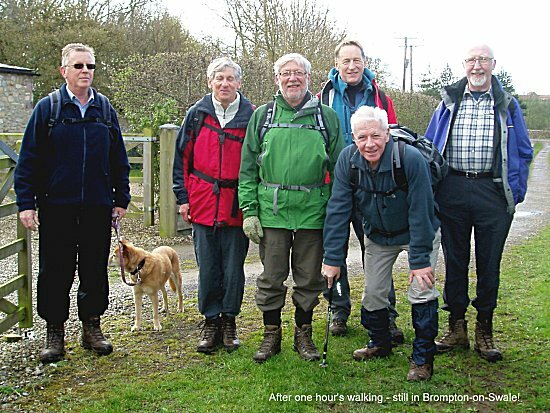 They hoped that they would be able to free themselves and reappear in time for the next walk, perhaps looking only slightly more disheveled than usual. 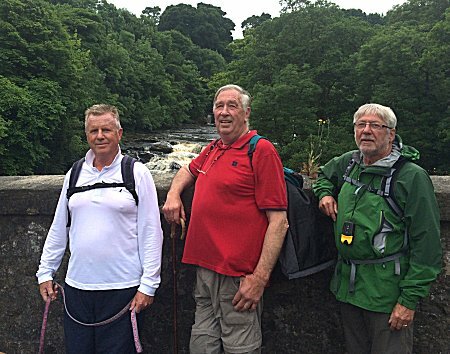 It was noted that with some regret, that only Cliff and Ron (and Ella) actually completed the full walk!! Weather: Mostly OK, but with some rain. 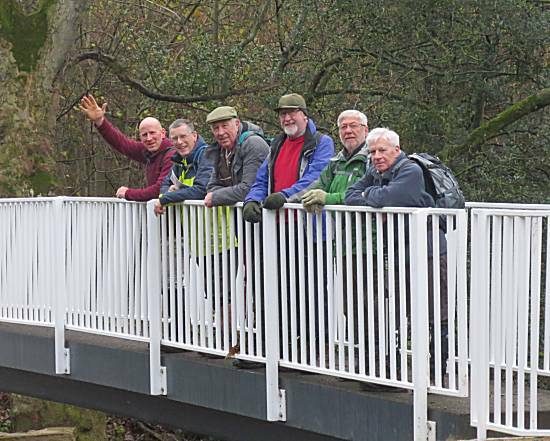 They knew that extra strength would be required for such a difficult walk and quickly located a bridge to top-up their energy levels. 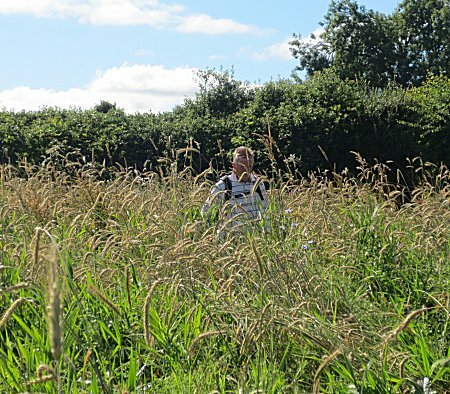 After the success of the diversion, they quickly returned to the planned path, but it became obvious that not many other walkers had been brave enough to attempt this route, as the pathway became indistinct and very overgrown. 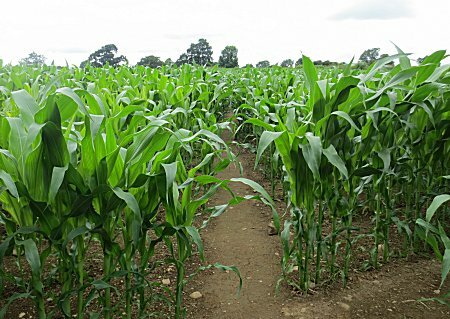 However, the walkers were relieved to see that the locals had cleared a route for the walkers through the giant maize field. 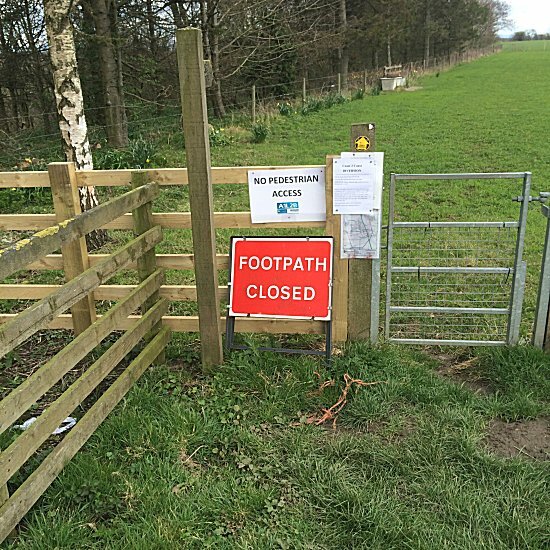 Further footpath diversions had to be negotiated before the walkers continue on their difficult route. 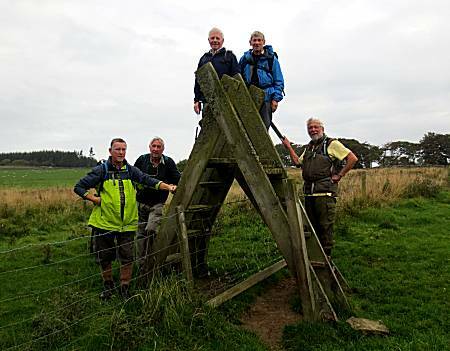 The route out of Low Ellington proved difficult, but with Sean's help the walkers were successful. 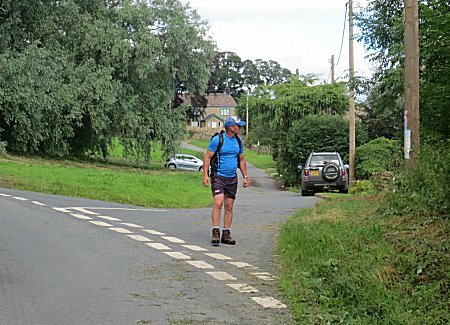 A Pork Pie stop was welcomed, but Sean continued to search the countryside for signs of Masham in the distance. 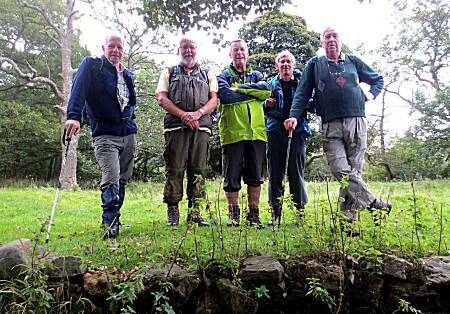 Reaching the River Ure indicated to the walkers that they were on the right route to reach Masham on schedule. 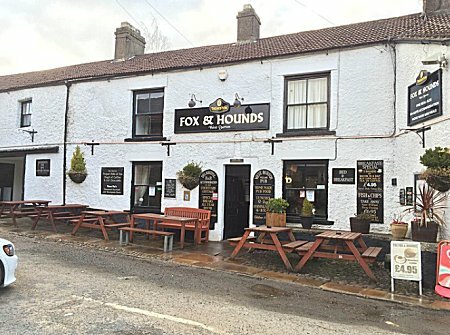 The walkers quickly located the Bruce Arms and selected this for their lunchtime stop, cunningly electing Black Sheep ale, which was brewed only a short distance away. 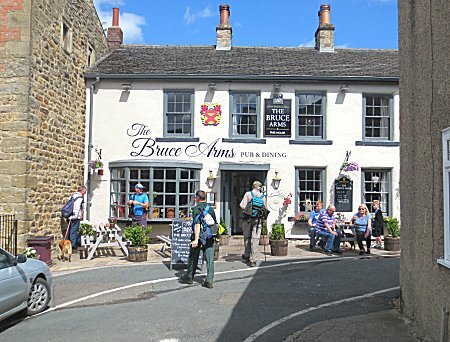 The walkers enjoyed healthy chunky homemade chips in the sunshine outside the Bruce Arms. 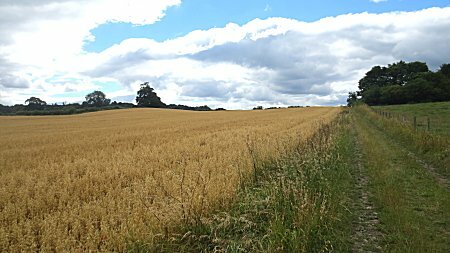 Leaving Masham, large fields of Oats indicated to the walkers that they were on the correct route back to their cars at Fearby. 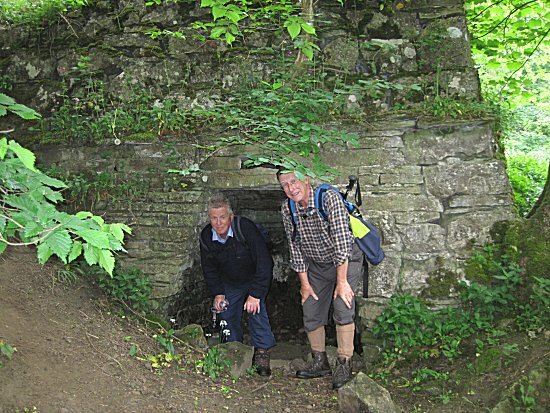 The walkers were greatly relieved. 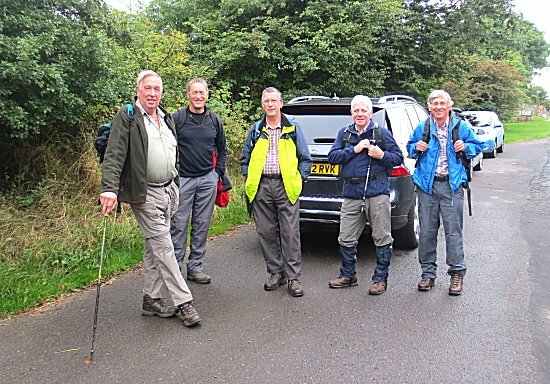 The walkers were delighted to reach their cars at Fearby in record time after a successful mission. 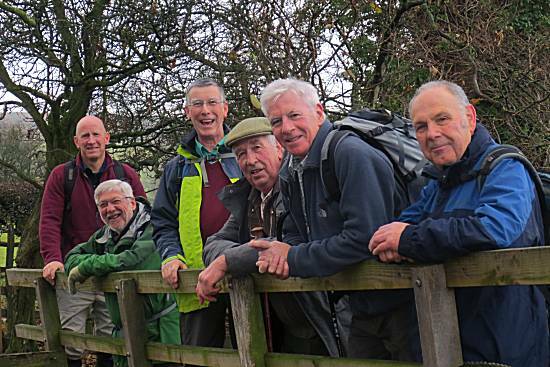 Six walkers arrived at the layby just before West Witton, anxious to consume Cliff's excellent Bacon, Sausage and Egg butties, before setting off into the village. 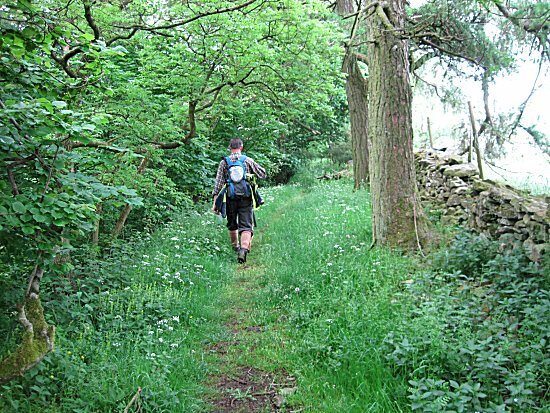 They quickly turned northwards onto what they considered to be an ancient droving road into the Bolton Estate. 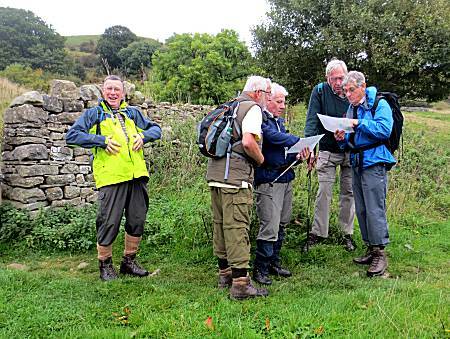 The walkers were quick to help Paul with his map reading by pointing out the correct route. Paul was not amused!! 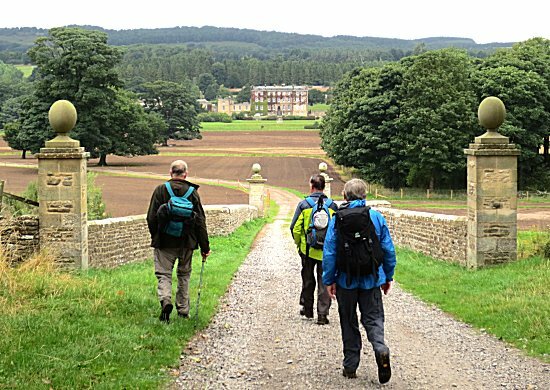 Lord Bolton of Bolton Hall welcomed the famous walkers and opened all the gates to his vast estate. . 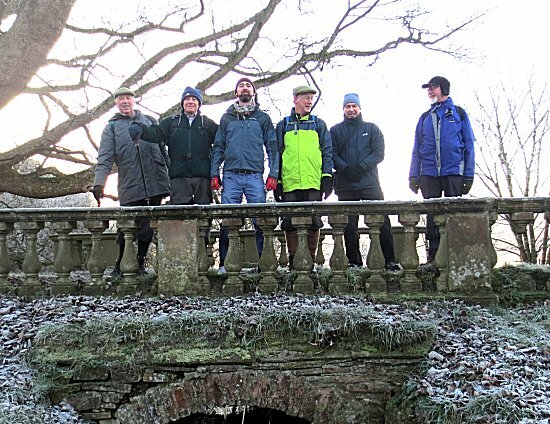 The cunning walkers refused to have a pie stop on Lords Bridge, electing to travel onwards before the forecast bad weather closed in. 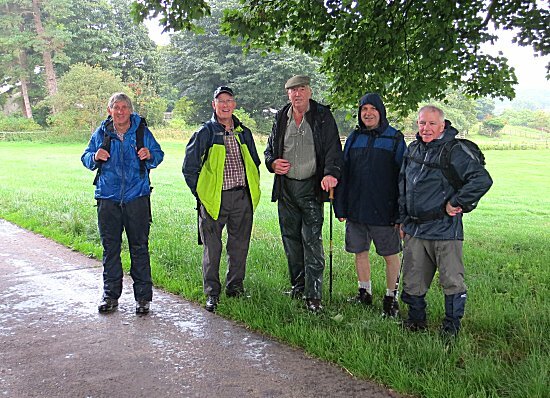 As predicted the bad weather closed in and the walkers had to take cover under a tree whilst they discussed their options. 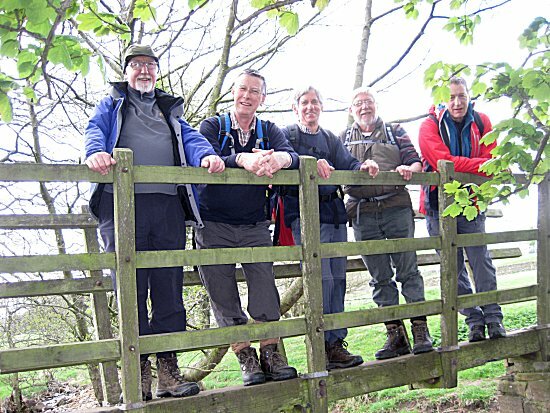 They elected to head directly to the The Three Horseshoes in Wensley . 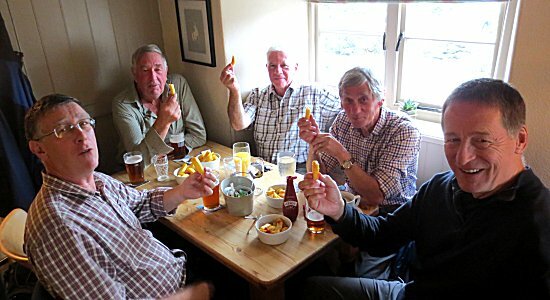 Here they enjoyed pints of Black Sheep ale and feasted on bowls of homemade chunky chips, whilst they considered their options. 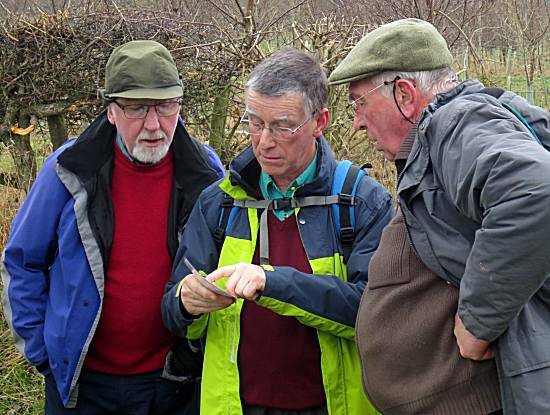 It was not long before their leader came up with a cunning plan!!! 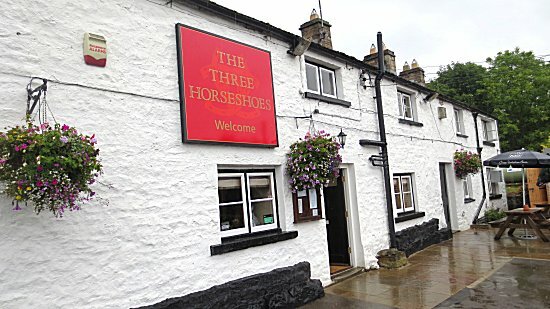 Using Skype communications and the pub's free WiFi, Paul's wife Susan was contacted in her car and requested to divert to the Three Horseshoes to transport the walkers back to their cars. 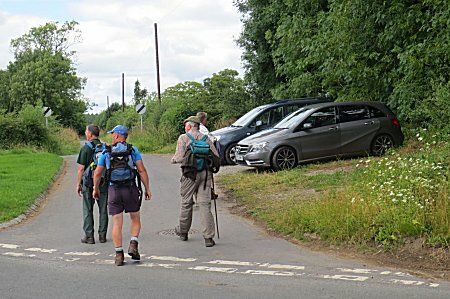 Six walkers arrived at the Round Howe Car Park to the west of Richmond, paying the £4 parking charge. 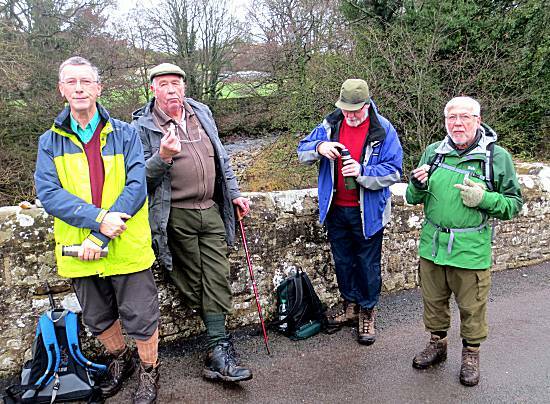 Cliff arrived with a supply of excellent Bacon, Sausage and Egg butties, before obtaining maximum sympathy from the others following the extraction of tooth roots the previous afternoon. Ed took control of the walk, but is was obvious that Paul was not happy about this loss of control. 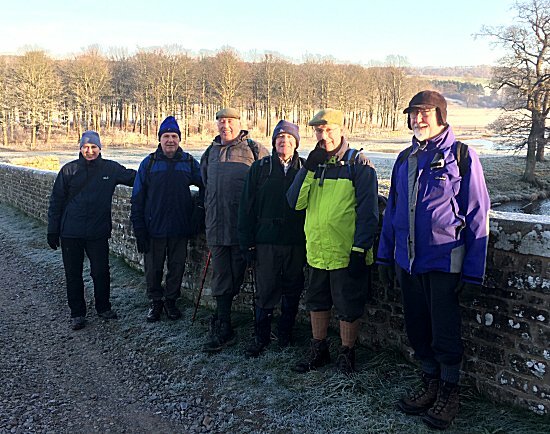 The walkers set off from the car park soon turning uphill to elevated ground with views across the River Swale valley to Hudswell, which is their planned lunchtime stop. 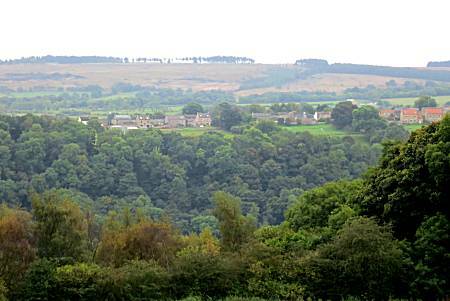 As they are higher than the village, they considered use of a zip wire to obtain rapid access, but discounted it on grounds of safety. 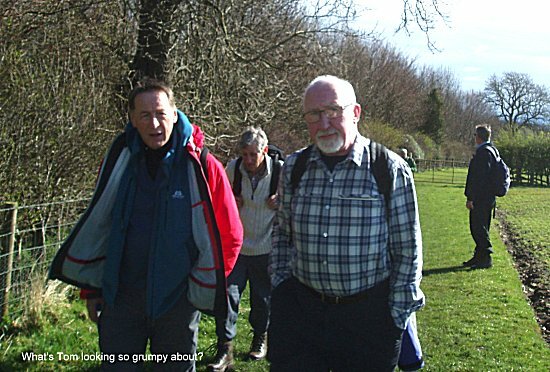 Paul was known to be highly amused when Ed became lost, but hid his feelings very effectively. 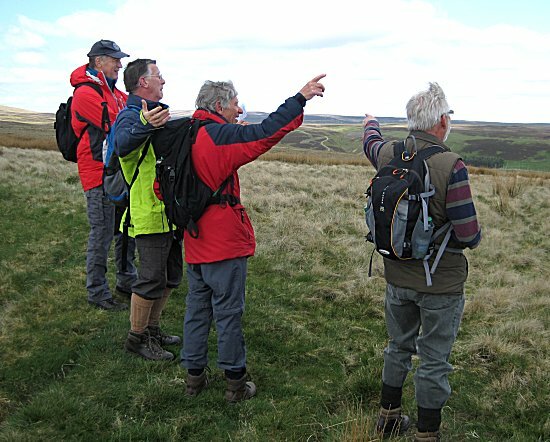 The cunning walkers used a nearby observation tower to help locate the Willance's Leap monument and take in the breathtaking views of Swaledale. 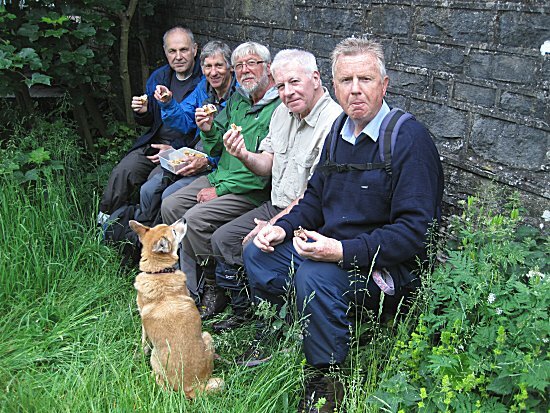 Ed controlled the walk with military precision and at precisely 11am the walkers stopped for their Pork Pie fix. 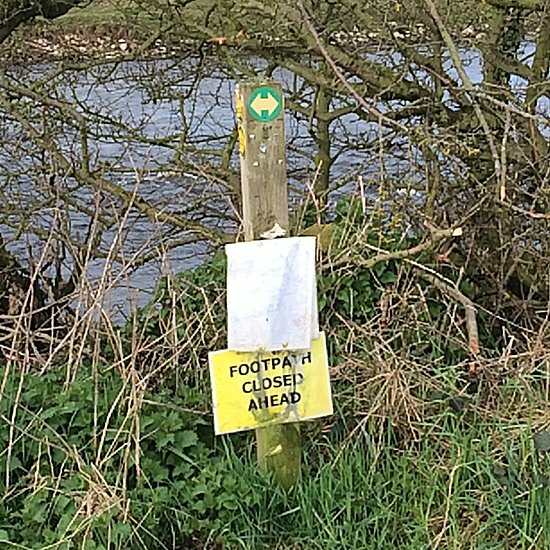 Characteristically, Ed had marked the route with red spots to indicate strategic hourly target points and the walkers can be seen searching for them. 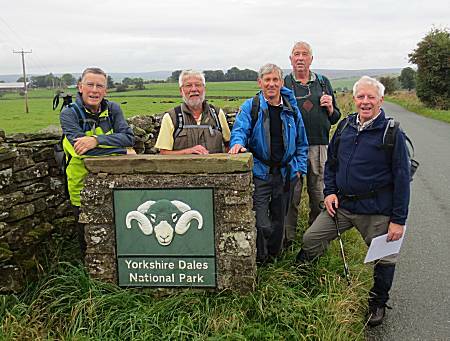 The walkers were proud to have located the Yorkshire Dales National Park and were able to continue their walk with added purpose. 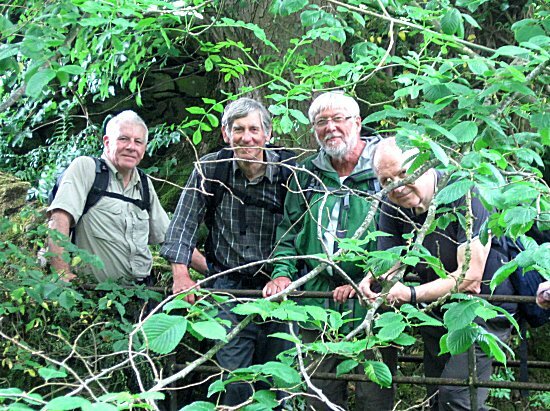 The walkers made their way up steep tracks to reach the village of Hudswell, where they enjoyed high quality ales in the George and Dragon. 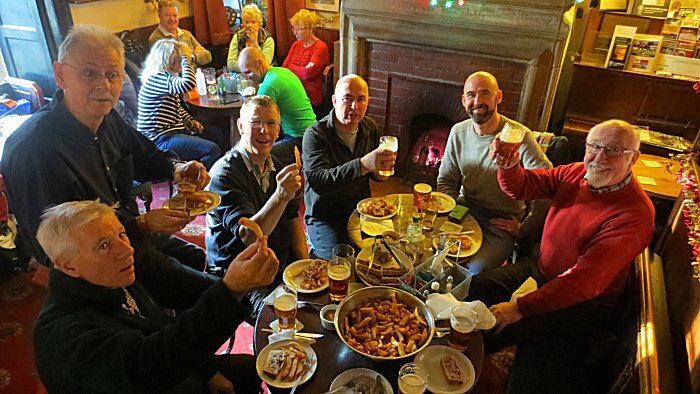 The staff at the George and Dragon rewarded the walkers for their incredible performance with bowls of perfectly cooked chips. 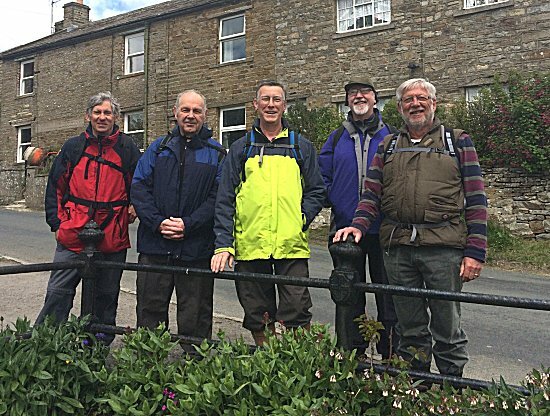 Seven walkers arrived in Middleham to partake in the Ron Fairbairn Memorial Walk, being the first walk since the loss of their walking friend. 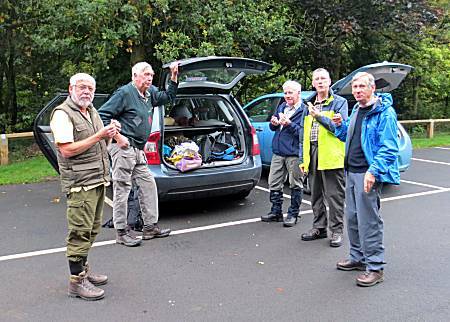 Bacon, Sausage and Egg butties, prepared by Cliff were enjoyed, before they set off up the hill towards the gallops. 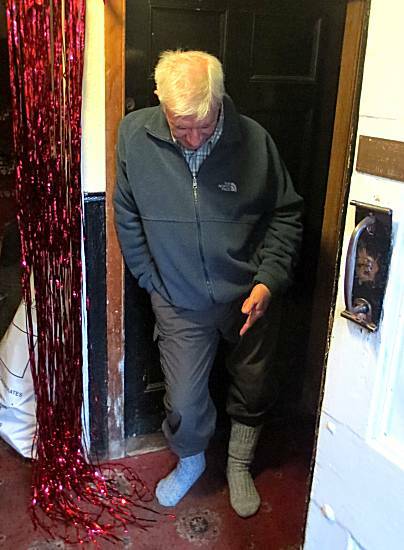 Cliff was proud to show to everyone his brand new shinny boots, but no one was to know the boot dramas that would unfold!!! 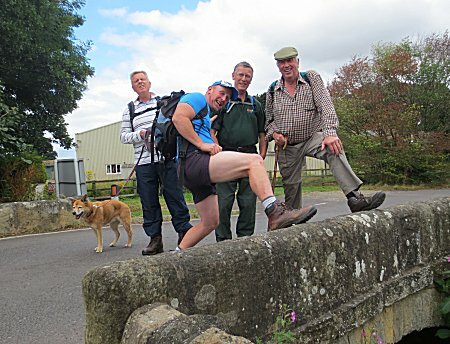 Eager to complete the walk in record time the walkers located many cunningly disguised bridges. 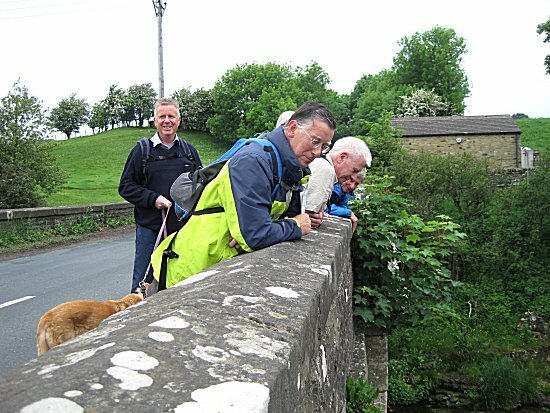 Paul insisted that the required Pork Pie stop was satisfactorily accomplished on a bridge, much to the amusement of the locals. 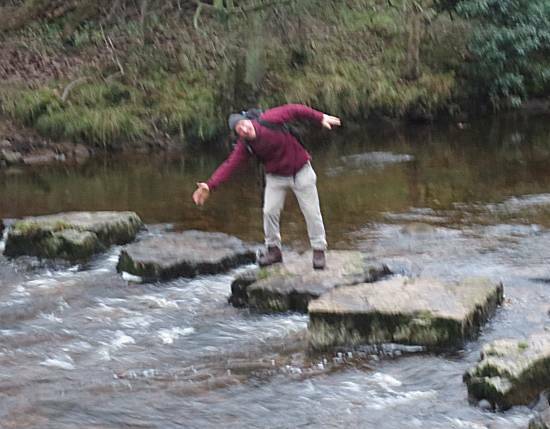 Sean was quick to demonstrate the exact position where Ron had fallen off the stepping stones on a previous walk. 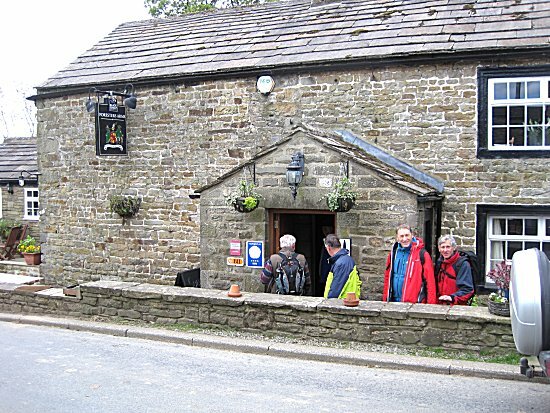 Arrival at the Coverbridge Inn was welcomed by the thirsty walkers, who consumed a number of pints of excellent Timothy Taylors Landlord ale, together with luxury chips. However, they were all oblivious to disaster that was about to unfold!!! 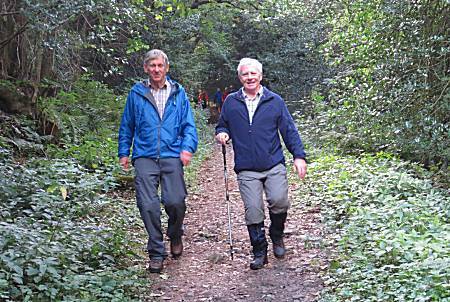 Whilst the other continued the walk, Tom and Ed considered that more ale might help locate the missing boots. 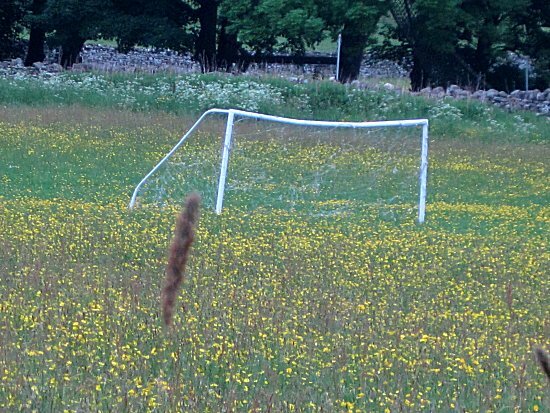 Maybe they are still there waiting for news of Ed's boots. 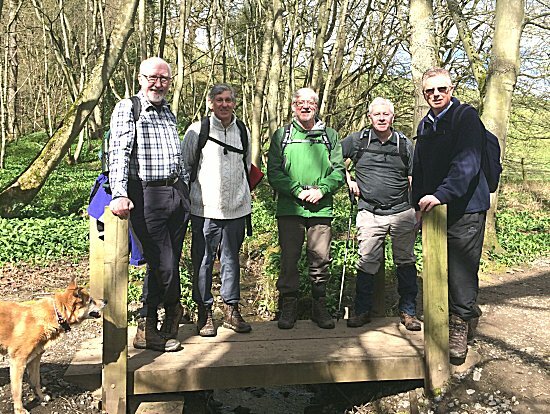 Will this signify the end of Ed's walking? Log on later for the latest updates. 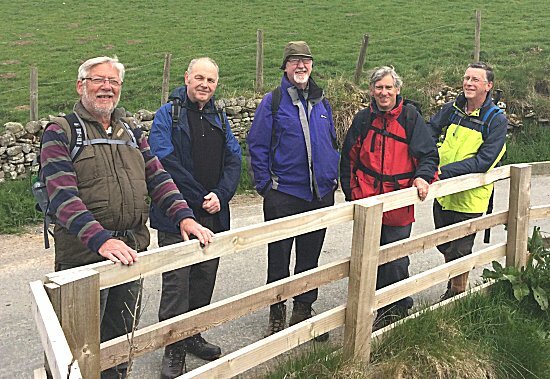 In a very efficient and economic manner, Paul's wife Susan collected most of the seven eager walkers and delivered them to the appointed starting place at the lay-by on Low Lane between Middleham and Wensley. 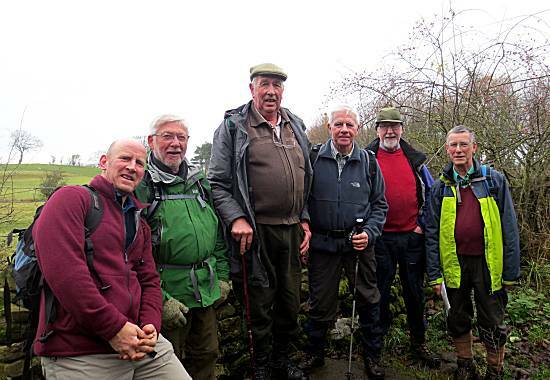 In order to prove himself, a new member of the group, Simon, vowed to lead the walkers to locate a giant windmill generator system, but the others were sceptical. 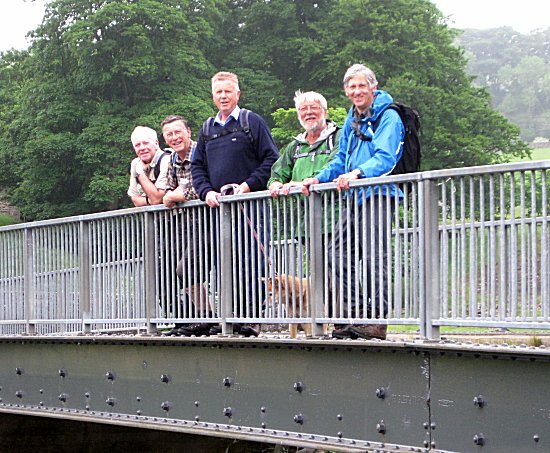 Additional strength was gained on Lords Bridge, as the walkers shared their minimal supply of mars bar crispies. However, they were still acutely aware that there was no sign of the magical giant windmill generator system, as promised by Simon. 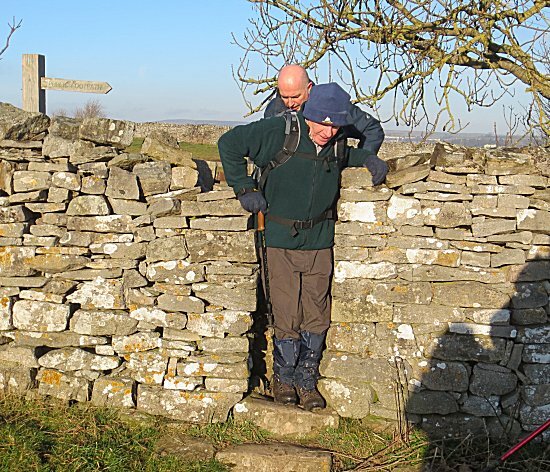 Ed skilfully led the walkers to an access through the wall, thus shortening the route into Middleham by several yards. However, even this did not dispel the disquiet from the others with the lack of sighting of the illusive windmill generator. 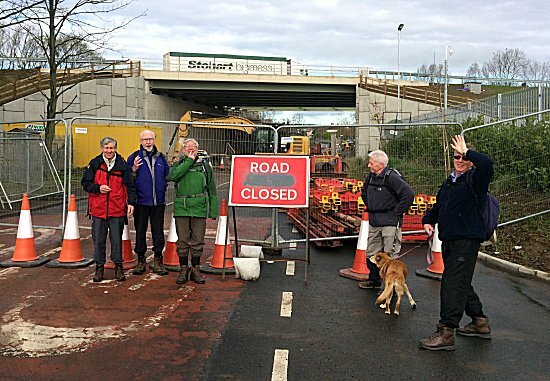 Ed knew that more bridges would be required. 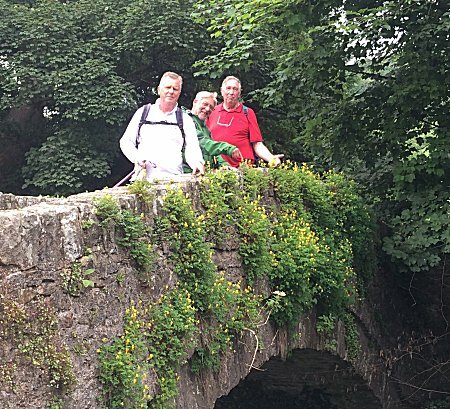 Ed was relieved to find just one more bridge, knowing that secretly this would guarantee success to the walkers with their difficult mission. 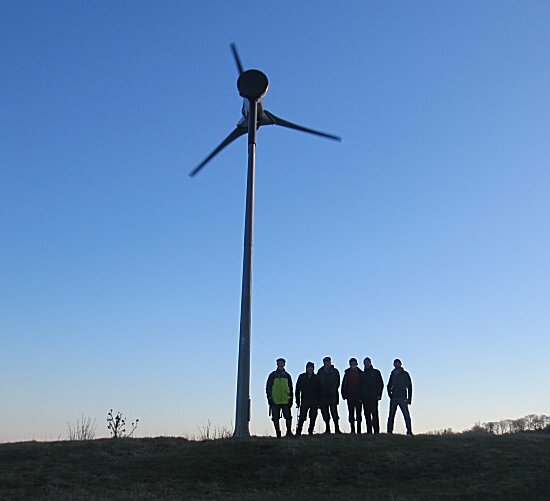 In the fading light, after miles of challenging walking the walkers were relieved to find the giant windmill electric generator system. 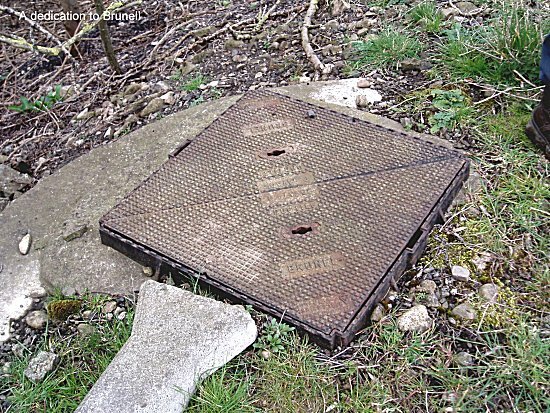 They were disappointed to note that it had not been connected to the local pub electrical system. 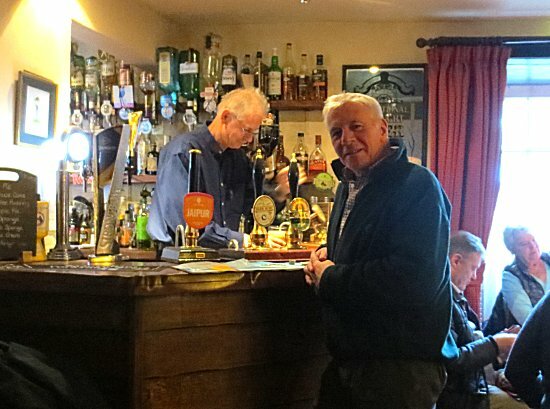 Using their incredible skills they quickly installed the necessary cables and commissioned the generator, in the hope that it would again allow the ale to flow at the Cover Bridge Inn. 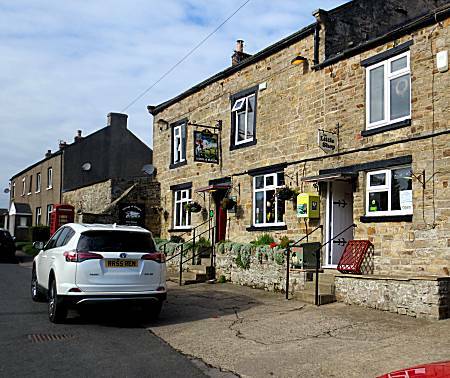 Arrival at the Cover Bridge Inn was celebrated by crowds of locals, whilst Ed was quick to confirm with Nick the landlord that the power had indeed reached the pumps. 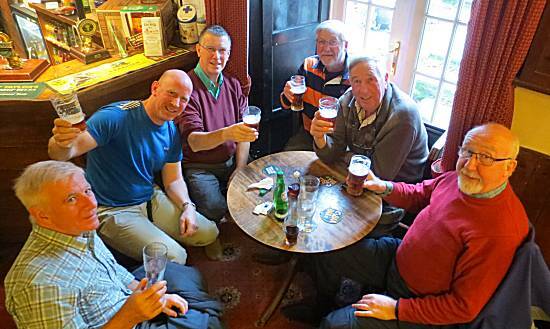 The first (birthday) round of Timothy Taylors ales were purchased by Ed for the thirsty walkers. 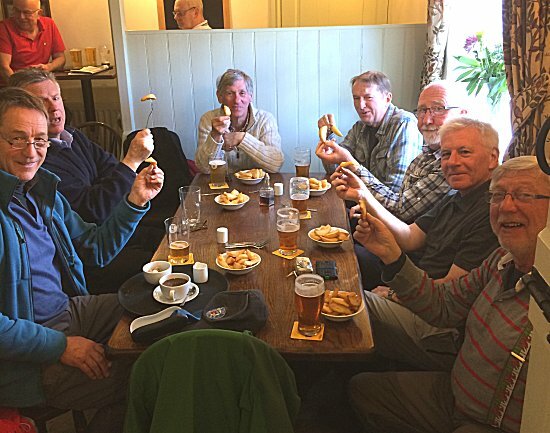 The walkers celebrated their success with portions of Cliff's excellent pie and a giant bowl of chips. More ale followed to celebrate Christmas. Pie & Chip Score: Excellent Pie with the biggest bowl of perfect chips. 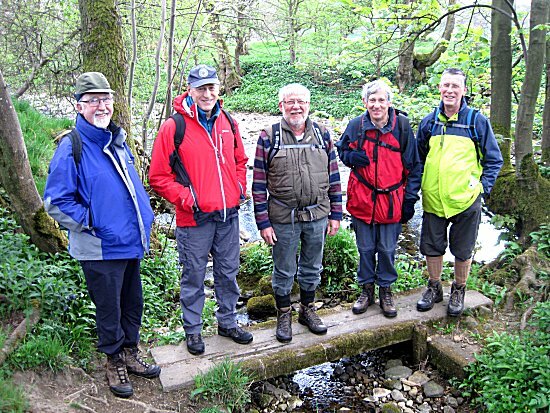 Walkers: Paul (leader), Ed (Birthday Boy), Cliff, Tom and son Michael, Alan and special guest Simon.